This guide shows how to manage the navigation menu on the main page. The navigation menu automatically follows the structure of your site, so it's possible to customize your menu by organizing folders and pages in the site map. At the top level of the site map, you will drag and drop folders to achieve the desired order. You cannot move the Homepage or place folders above it. When you move your cursor over the left edge of the site map, you'll see two orange dots indicating the "handle" where you can click and hold. You'll also see the cursor change to two crossed lines. This method only allows you to rearrange contents at the same level. In other words, you can't drag and drop a page into a different folder. As you drag your selected folder to the desired location, other folders will move to open a spot where you can drop the folder. In the example below, the About folder will be placed between the Departments and Schools folders. You may nest your folders using as many layers as you wish, though practically speaking, more than 3 layers of nesting will be difficult to manage. 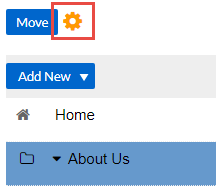 Select the page or folder you wish to move, then click the Move button. A window with the folder structure of your site map will appear. 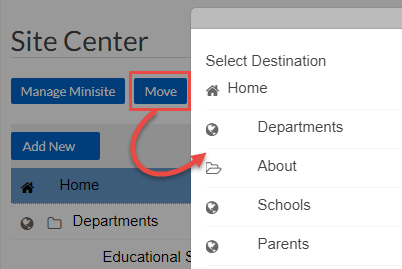 Select the destination folder by clicking on the pop up site map. To move your selected item to the very top level, choose "Home". For folders and links, click the row in the site map that contains the folder or link, then click the gear icon above. Clicking it produces a popup window where you can edit the name. In the case of minisites, there's one extra step. 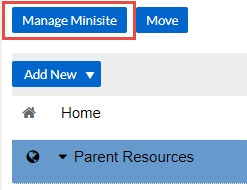 First click the row of the Minisite, then click the "Manage Minisite" button above. On the next page you'll see the gear icon. Click the gear icon to end the name of the Minisite. Click on a folder to expand its contents. Folders may contain pages and other folders. Because we wish to arrange the contents of a folder, all of which exist at the same level in the site map, we will use the drag and drop method again. 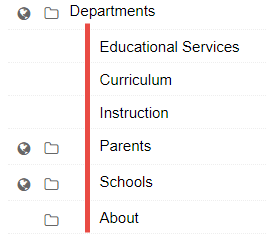 In the example below, the Departments folder contains 6 items: 3 pages and 3 folders (a red line was drawn just to make the parent-child relationship clearer). You may drag and drop these items into any order you wish. Pages and folders may be interspersed. Continue using the above techniques until your sitemap is in the exact order you desire.